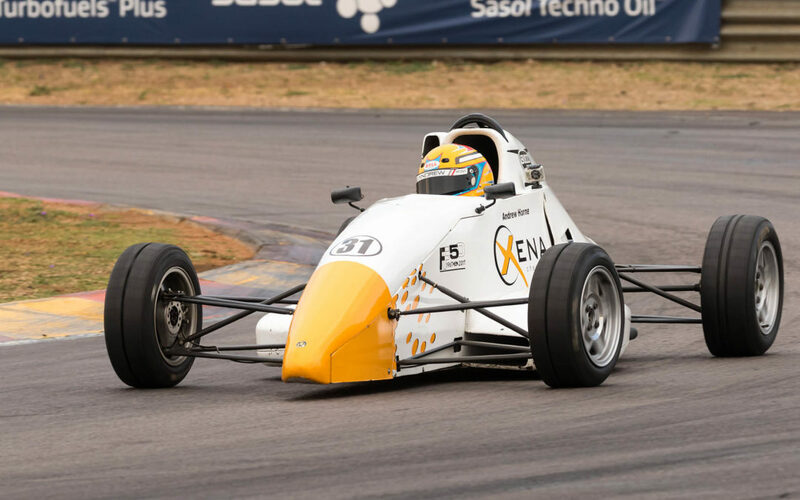 Andrew Horne (Xena Chemicals / Budd Power van Diemen) and David Jermy (Beauty Factory van Diemen) head to Zwartkops Raceway on Saturday, 3 November to decide the outcome of the 2018 Investchem Formula Ford Kent Championship. Although Horne has an eight-point advantage over his rival, when the pair last visited the circuit at the end of September it was Jermy who had the better outing, taking a win and a second place in the two races while Horne could only manage two third places. While Dean Venter’s chance of defending his title has gone, the TEU Southern Africa Swift driver is more than capable of challenging for race victories on the day. He also needs as many points as possible to consolidate his hold on third on the championship log. Jonathan Nash (Turnfab Engineering Swift) had his best race meeting ever at the last round, following up on second place in the opening heat with a hard-fought win in the second and setting the day’s fastest lap, to close the gap to Venter in the championship standings to just six points. Alex Vos (Ecurie Zoo Swift) lies fifth in the standings. He has been a regular podium finisher this season although exam commitments could prevent him from being among the front-runners at Zwartkops. James Reeves (Ray) has had a slightly disappointing season this year but has shown that he has the pace to mount a serious challenge. Business and family commitments, coupled with some problems with his Debella Finance van Diemen have prevented Dalan Holton from competing in as many races as he would have liked to this year, but he is another that can run close to the front on his day. Steve Venter (TEU Southern Africa Swift) and Allen Meyer (van Diemen) should also be on the grid. After Friday’s practice sessions, the serious business of the weekend will get underway at 07h15 on Saturday morning when drivers head out for a 10-minute qualifying session. The first of the two 10-lap races should start at 10h00 with race two scheduled for 14h10.